I read a story today about how the route between Eindhoven and Valkenswaard in the Netherlands was to be improved. Interestingly, the author of the story put the case that while the new cycle-path would cost €2-3 M, the benefits greatly outweighed the costs. He put the benefits at a value of €8 M due to saving of time for existing commuters and the likelihood that the new route would attract more people to cycle. More cycling means reduced emissions, cleaner air, health benefits to individuals, society as a whole and also to employers. The old, inferior route between Eindhoven and Valkenswaard for cyclists. The photo, with that caption, generated quite a lot of discussion on Twitter. I rode here with my family on holiday in 2003. 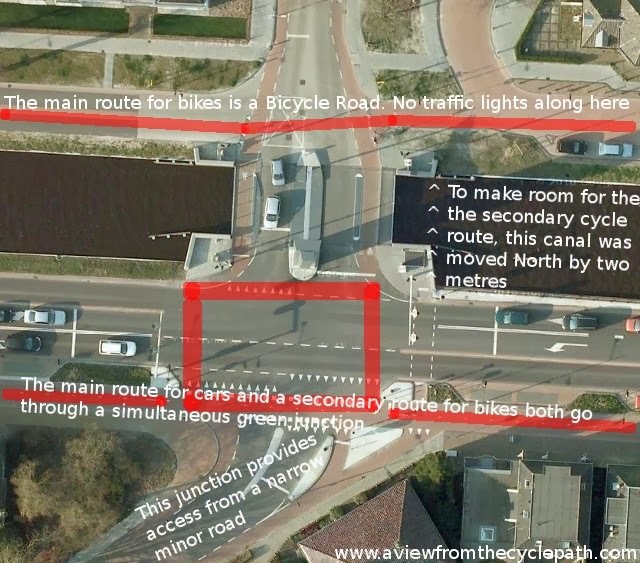 As well as retweeting the link, I also posted the photo above to twitter as an example of what the new improved cycle-path will allow people to avoid riding along. 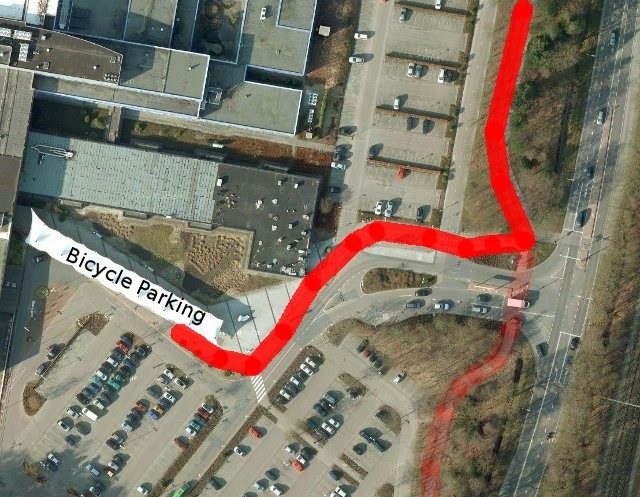 The benefit of the new path comes in part due to a more direct route for some users, but with my eyes now adjusted to living "40 years in the future" compared with other nations, I can now see how this cycle-path is inferior to best Dutch practice. Things have moved on in the last ten years. There is better infrastructure than this almost everywhere near where we now live. 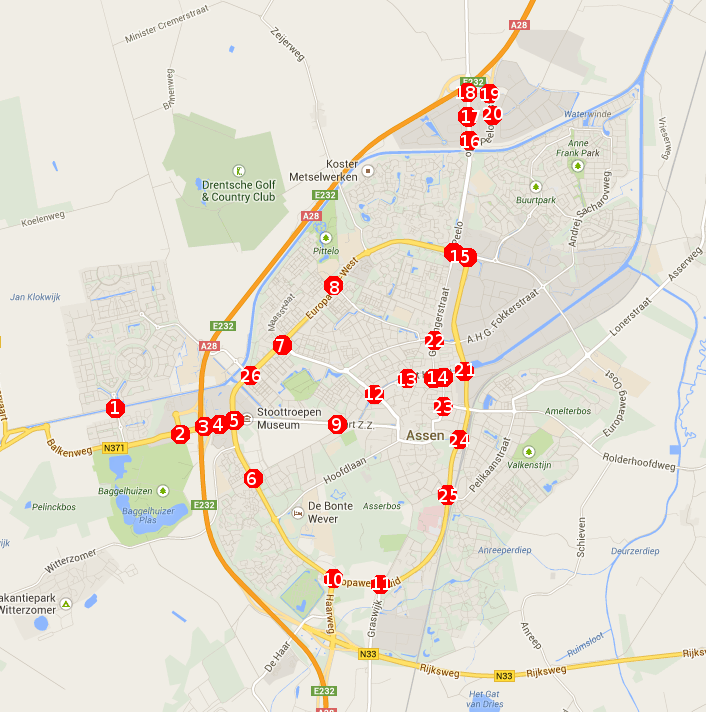 Andre Engels provided this map. 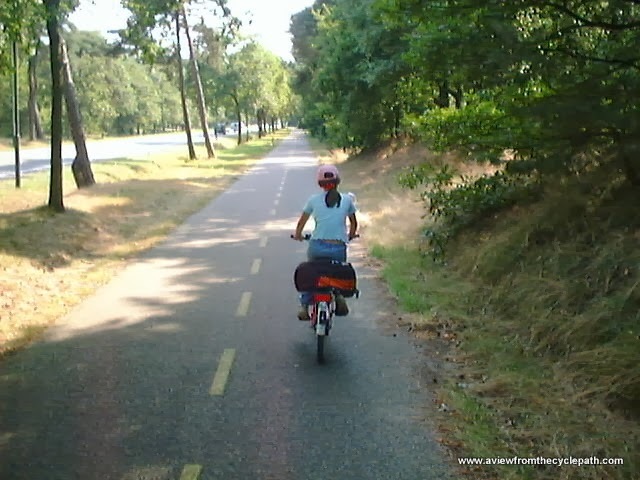 In 2003 this cycle-path impressed me enough to take photos specifically so that I could show them to campaigners in the UK as the sort of thing we should have been campaigning for, rather than the compromises which we were campaigning for. Overall, I'd still be as happy to ride there now as I was in 2003. It's not "bad" as such. However, this path is also not ideal in 2014 in the Netherlands. Expectations have increased and in order that people will want to cycle for a larger proportion of their journeys than they currently do, the quality of the experience has to be better than is offered by this cycle-path. The old cycle-path is not quite wide enough and it's alongside a busy road so can be noisy. Junction designs along here are not ideal and at some points the cycle-path is a bit too close to the road for comfort. 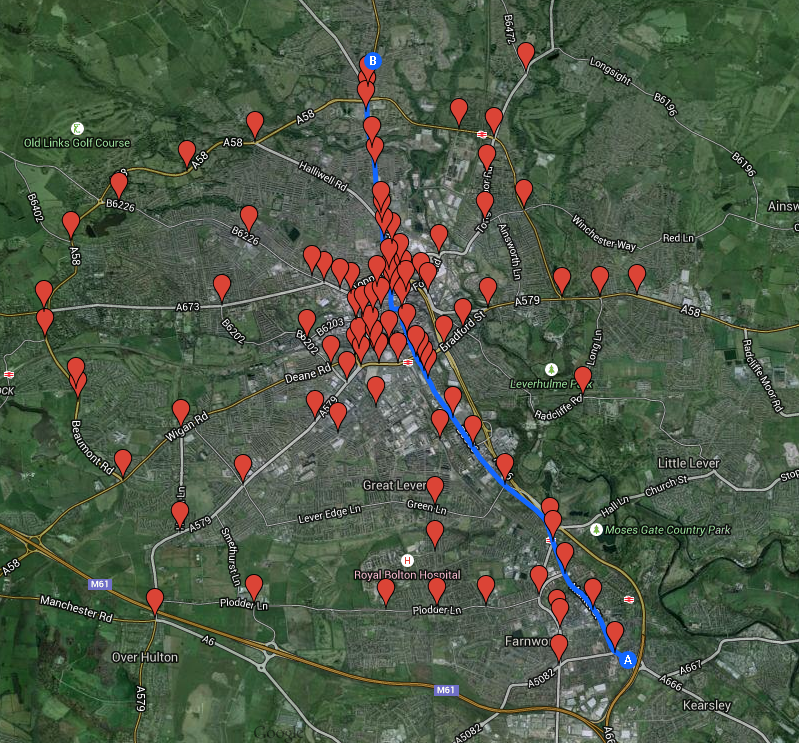 There are also some stops along the way which increase journey time. While the photo shows a point at which the cycle-path is bidirectional, further along there are single direction paths on both sides of the road. This requires that people cross the road. Once again, not ideal. The new route will avoid the problems of the old and because it will exist in parallel with the old route it offers people more choices and makes more journeys attractive for cycling. Not only will the different alignment of the route offer shorter distances for some cyclists, it is also expected to result in higher average speeds due to the relative lack of interruptions and higher surface quality. The Netherlands is not standing still. The rate of change and improvement to cycling infrastructure here is still beyond that of other countries which sometimes talk of "catching up". You can never catch up by starting from behind and doing less. Catching up will only happen as a result of out-spending and out-planning the Netherlands. Low aspirations and politicians delaying tactics and broken promises will never result in adequate progress. Make sure that "Going Dutch" isn't just a slogan. It's important to campaign for the highest standards. If you ask for less, you'll certainly achieve less. Falling further behind is the inevitable result. Just because something can be found in the Netherlands, that doesn't automatically mean it's best practice. On our study tours we not only demonstrate the best infrastructure which should be emulated but also point out why some infrastructure which may look impressive actually falls below the best standards. Our aim to to avoid inspiration being taken from the merely adequate and mistakes being made. Cycling infrastructure which is of such a quality that it can be used by the masses has a huge positive effect on the economy. This infrastructure doesn't have a cost to society but provides a benefit. It is only infrastructure which is of such low quality that it does not encourage mass cycling which places a burden on the economy. In the Netherlands, cycling infrastructure is a fiscal measure. It saves the country money. There are many reasons why it makes no sense at all for any nation to view cycling infrastructure as "too expensive" to build. The subject of cycling infrastructure being cheaper to build than not to build has been discussed before. Read part one. Christchurch in New Zealand published a Cycle Design Guide last year. My attention was drawn to it because of a bad design which I discovered came from this design guide. I've read most of the design guide now and sadly it's at least as deserving of criticism as Ontario's lacklustre design guide or the NACTO guidelines. This will not be a full point by point critique. I can provide one if Christchurch wants it. 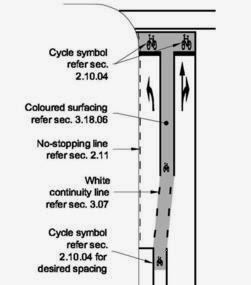 I was drawn to this section of the document because of the flawed illustration of this type of junction which had appeared across several New Zealand blogs. 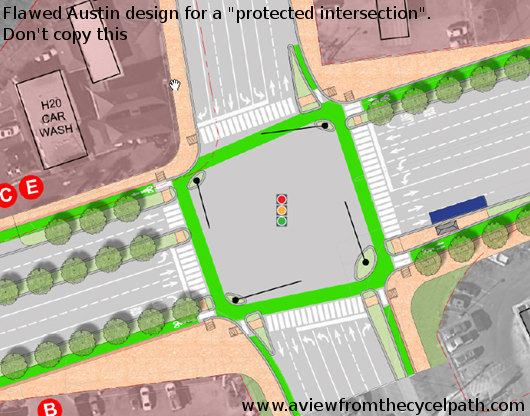 I found the image in a blog post on the Cycle Action Auckland site, but it originated in Christchurch's design guide. 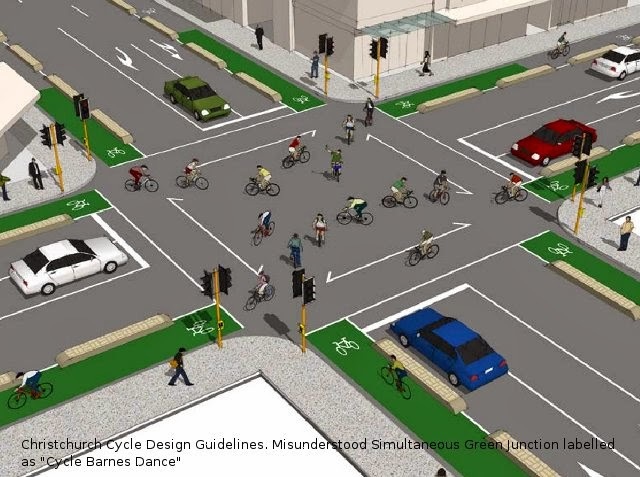 Christchurch's design guide calls this junction a "Dutch Junction". 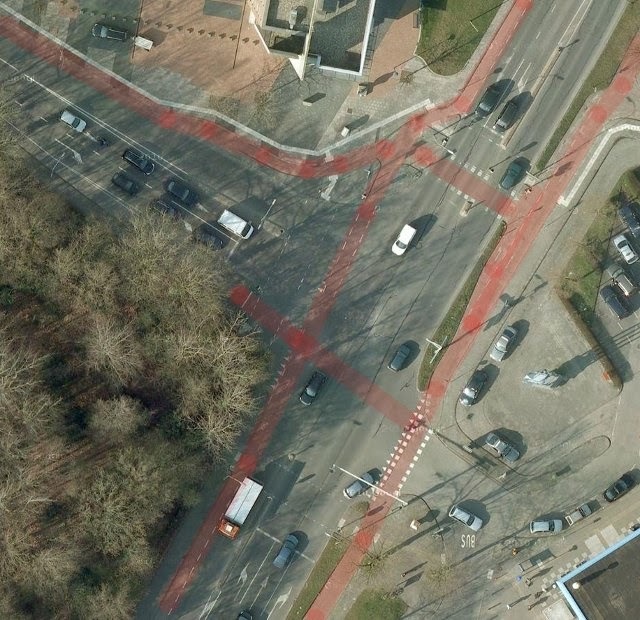 The section about this type of junction starts on page 32 of the document where there are two photos of what the authors think a "Dutch junction" looks like. However, neither of these photos are actually they think they are. The upper photo is actually of a simultaneous green junction while the lower photo doesn't look like the Netherlands. The Christchurch design misses many key details. The geometry of it is also completely wrong. Cyclists are shown as stopping at the same stop line as drivers so there is no head start over drivers. That is not according to Dutch practice. In the picture there appear to be no cycle traffic lights. The description only says that separate lights are required "ideally". What's more, they don't seem to have understood how cyclists are protected in the Netherlands from drivers turning left across their path. 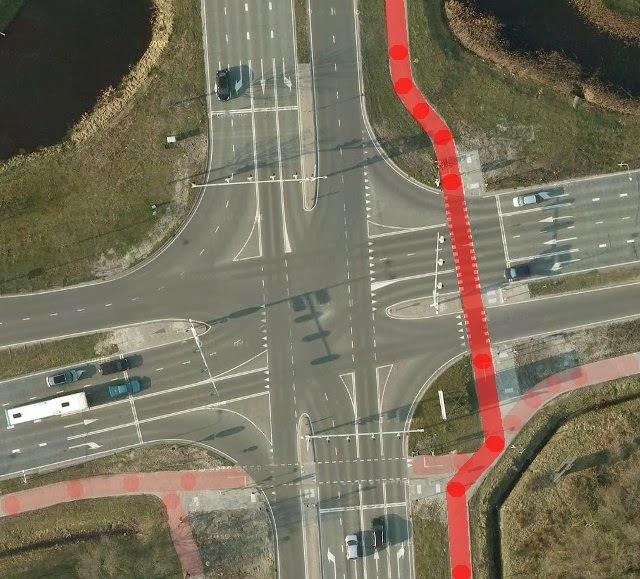 The Christchurch document merely says that this type of junction "can incorporate advanced cycle starts", which is not the way in which cyclists are usually kept safe in the Netherlands. 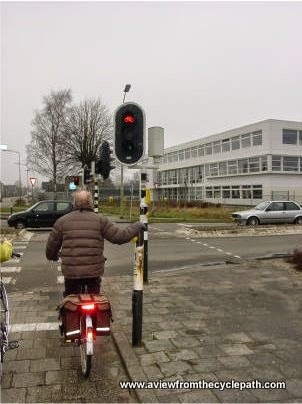 In the Netherlands current practice would require that drivers turning left do not receive a green light to proceed at the same time as cyclists have a green light to go straight on. There also appears to be no expectation that cyclists will benefit from being able to make a left turn when the traffic lights are red. That's normal in the Netherlands and helps to offset any additional delays that cyclists might have on occasions when they are turning right. With this design you would also expect to see multiple lanes on road (Mark's sketch, which seemingly inspired this, includes such on one arm). 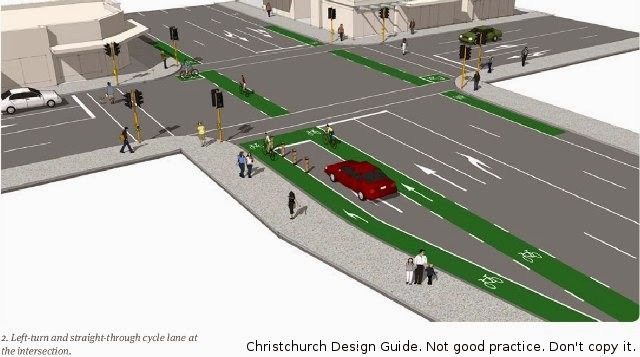 What's more, there's no way for a cyclist who has crossed one arm of Christchurch "Dutch" junction and wants then to turn right to actually see his traffic light as it will be behind him. To end, the angles at the junction are wrong. Cyclists travel through graceful curves, they cannot make on the spot 45 degree turns. Christchurch's design guide features a mish-mash of different ideas from all across the world with no apparent overall concept of which is the proper way to go. There are some relatively good ideas, though even these are compromised in the way they are presented, but they're given equal billing with types of infrastructure which happily no longer exist here in Assen (advanced stop boxes, cycle-lanes in the middle of the road) and other things which we never had in Assen and would never want to see (sharrows, two stage "hook" turns). The design guide also offers an interesting insight into how the designers view cycling. For instance, page 16 discusses one type of "major cycleway". This lacks specifics such as how wide a cycle-path should be but they clearly expect cyclists to make slow progress ("approximately 15 km/hr for expected users" of one type of "major cycleway") and they want to micro-manage how cyclists cycle (messages stencilled onto paths "move off path when stopped", "warn when approaching"). This would appear to be a tacit admission that the planned width is rather narrow, such that these low speeds and warnings might be required for safety. Good cycling infrastructure never requires cyclists to travel at an artificially low speed. both sides of the road" is required in order that cyclists can pass each other while by page 24 that has reduced to "approximately 1.8m to 2m on both sides of the road"
Christchurch's design guide is not a coherent piece of work but more of a summary of things that the authors have read about, and in some cases misunderstood. 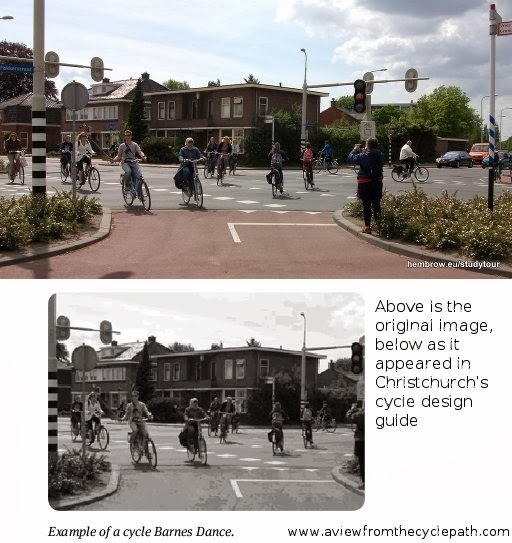 Someone working for Christchurch copied a photo from my blog of a simultaneous green junction here in Assen (find it here), edited it to remove my URL, and reproduced in black and white on page 34 of Christchurch's document. It is labelled "Cycle Barnes Dance". Perhaps after all that work they thought I'd never find it. While a small number of people are credited as photographers on page two of the document, my name does not appear and I certainly wasn't asked for permission to use this photo. I wonder who took credit for this photo ? 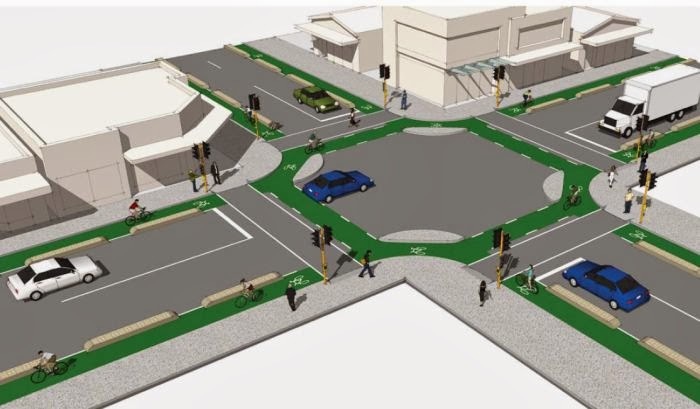 Christchurch's take on a simultaneous green junction. They've missed key details of the design. This photo is taken from Christchurch's document. I certainly do not claim credit for it. 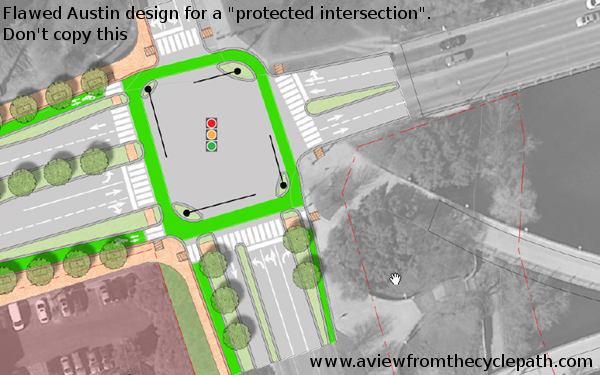 Unfortunately, the authors of the document have clearly misunderstood how simultaneous green junctions work. They have unhelpfully provided extra paint on the ground seemingly to guide cyclists to ride across diagonally rather than using the curved paths that are normally taken and which are essential to avoid collusions. They've also again forgotten about the opportunity turn right against a red light at junctions like this. That's normal in the Netherlands. The text accompanying this is also interesting to read. Again, the document refers to separate traffic lights for cyclists being required at such a junction only "ideally", suggesting that you could allow cyclists to cross like this at the same time as drivers were in motion. I'd expect that to cause carnage. It never happens in the Netherlands. There are always separate traffic lights for cyclists at simultaneous green junctions. This is not optional. The document also refers to a possibility of combining the pedestrian and cycle phases, which again does not happen in the Netherlands because this would cause conflict and probably injury. The further I read through the document, the more examples of lacklustre design glare out at me. On page 38 there's a photo of a really dreadful and actually pointlessly badly designed "cycle bypass" (compare with the same concept done properly). On page 41 there's a relatively decent bus stop bypass design followed by a design which is almost impossibly bad on page 43. By page 57 it's back to discussing how to "encourage slower cycle speeds" (this should never happen) on shared paths on a page which also features a narrow "berm separated" cycle path which has an enormous drain in it. Christchurch uses the term "hook turn" to refer to what is known elsewhere as a two stage turn. In most parts of the world, the word hook is used in this context to refer to the type of crash that it common to this type of infrastructure. Cyclists turning left have a potential left hook problem due to there being positioned on the left of left turning motor vehicles. Even though there's a separate lane for cyclists turning left, no thought has been given to how cyclists could have been allowed to turn left on red without conflicting with anyone. Cyclists going straight on experience added potential for danger due to having to try to stay in the middle of the road cycle lane. Drivers on their right but who want to turn left will turn across this lane. Advanced stop lines have never really provided any benefit to cyclists. Cyclists turning right are expected to go straight on, then slam on the brakes in front of other cyclists, turn left a bit and wait in the small green box. However, they won't know when the traffic light for their direction has gone green because it's behind them. 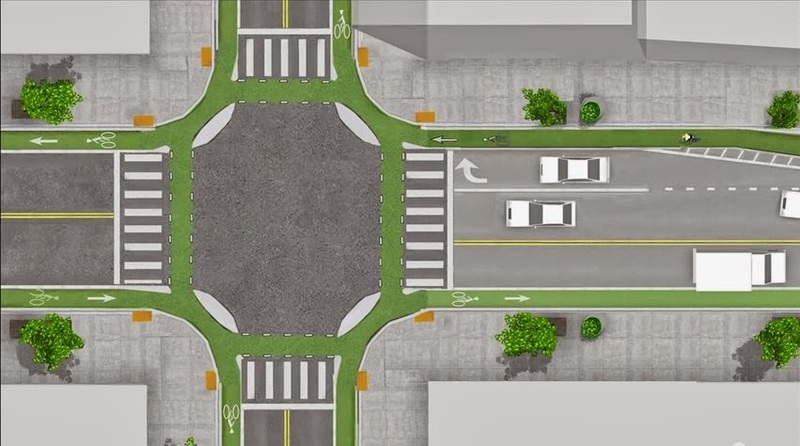 If there's a separate left turn phase then drivers wanting to turn left who come from behind the cyclists waiting in the box won't be able to get past those cyclists. Cyclists need to be able to make efficient journeys so many won't want to make their right turns in this inefficient way. That does not only apply to "fast" cyclists, but to everyone. If a child is late for school, they won't want to use this box either. 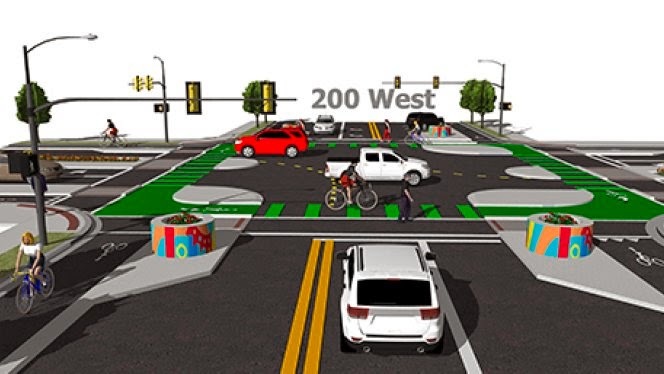 They will have to cross two lanes of traffic on the approach in order to be in the right turn lane. Drivers will resent this because the cyclist is not using the provided cycle facility. Cyclists coming in the opposite direction are forced into a left hook situation with drivers who wish to turn left. I have to also mention that treatment of roundabouts is lacking. On page 64, they're talking about "taking the lane" on roundabouts. That's a very long way from best Dutch practice. It goes on and on. 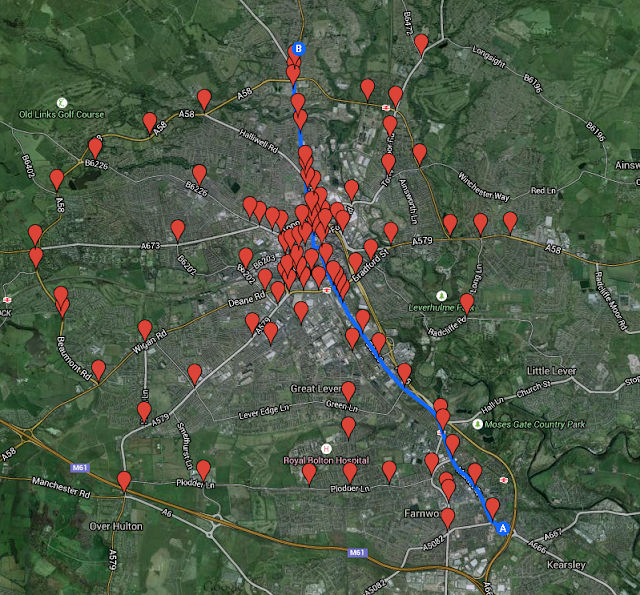 There are very few gems in there (the bus stop bypass design isn't bad). Very few. Please, Christchurch, if it's not too late, do not adopt these guidelines. You need coherence in design, not a mixture of ideas picked up from different places and with a wide range of different qualities. Copy from the best, not from everything that you've seen. Christchurch could have found out a lot more in advance. For a start, they could have asked us specific questions about how these junctions work. They could have asked about what is actually built and how well it works but also specifics such as measurements of different parts of the junctions, radii. Instead of guessing and writing down those guesses as design guidance, they could have found out in advance and adopted best practice. Christchurch could even have employed us to write about things that we do know about rather than employing someone else to write about what they don't know about. understood what they're looking at. Ironically, the URL which someone in Christchurch removed from my photo was for the cycling infrastructure Study Tour on which they could have sent participants to learn about real Dutch cycling infrastructure so they can't have been ignorant of what they did. The photo was taken during a study tour and two previous participants are shown. One of them is cut in half by Christchurch's edit. It seems to me to be very strange to start by writing standards and only find out later on what it is that you should have been doing. Surely it would be beneficial for Christchurch to send people to see infrastructure like this first hand before making an expensive and dangerous mistake by copying it incorrectly. That my photo has been taken without permission and without credit and used in the Christchurch design guide should not in any way be thought to represent my endorsement of their guide. 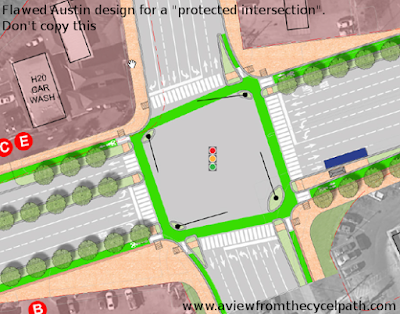 Overall, this is a poor guide to cycle infrastructure design.